About the Sisseton-Wahpeton Sioux (Lake Traverse): As river-plains people, the Sisseton-Wahpeton Sioux farmed and hunted buffalo. Great numbers of miners from many non-Native cultures from the east headed west during the Gold Rush of 1862 forcing the Sisseton-Wahpeton to migrate. The Tribe eventually settled in northeastern South Dakota. History of the Reservation: The Act of 1889 divided the Great Sioux Nation into smaller reservations, including the Sisseton Reservation. The reservations created in 1889 amounted to less than half the acreage granted by treaty to the original Great Sioux Nation. 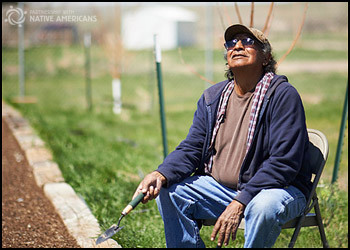 Life on the Reservation: The Sisseton-Wahpeton Sioux sustain some income through farming and ranching. A tribal Casino and Bingo operation and a small plastic bag factory also provide some jobs. Despite these efforts to fuel the Reservation’s economy, jobs are scarce, and unemployment on the reservation runs at 22%. Sisseton on the map: Northeastern South Dakota.